Corlyss knew about time. When she was a young bride in the Philippines her husband of just a few months contracted polio and died. She climbed into the military transport to accompany his body home. Her life was over, time had come to an end, but an odd thing happened. The sun continued to rise and the world went on. If she wasn’t going to die of grief, she decided she wanted to live for something important. Corlyss knew about time so, as the scripture says, she took the time God had given her to apply her heart unto wisdom. She studied, becoming a missionary to China. After serving her tour she returned home with her adopted Chinese son. She married had a family, and taught school. Corlyss knew about time, so she organized work crews to go to Sager Brown, covenant groups, taught Disciple I, II, III, and IV, Sunday school, and tutored children. Corlyss would have told you she didn’t have a story….that her life was ordinary. Corlyss knew about time so when I met her even though she had all the friends she needed she took time to reach out and encircled me. Her wide ranging intellectual interests and love for bridge brought her a diverse group of friends, and for the last six years I have gone to her home once a week to learn about things as old as the Iliad and as new as the latest research on the human brain. Though she was 83 years old, she never seemed “old” to me, and So it was quite shocking to learn that on the day following our regular group meeting that she’d entered the hospital for tests. Two days later, after school, I drove to Vanderbilt. As I peered around the corner into her room, she was sitting up wrapped in a purple and white feather boa. That seemed perfectly normal. She was always ready for a celebration. She motioned me into the room. ”Come in, we are planning a funeral” she announced. “Who died and when is the funeral, I asked. My old red 99 Saturn quickly learned the shortest distance from school to hospice, and took me there three times a week, like clock work. I don’t have that kind of time in my schedule, but we aren’t talking about my time here. We are talking about God’s time and somehow there was always just enough time in the day for a visit. When the call came, two weeks ago that she was gone, I kept my word and read the poem on the legal pad, as directed. But, I wanted to learn the story behind the poem. I called its author, Lynn, Corlyss’ sister. She had written the poem after the death of their father. 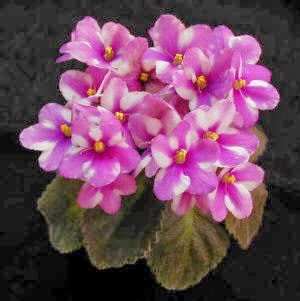 ‘You see, she began I had received an African Violet as a gift.” Like most of us Lynn felt responsible for keeping it alive. She carefully removed dead leaves, fed and watered it. Years came and went. Still, it refused to respond. Then in the last week of her father's life, a single paltry purple bloom appeared. Corlyss and Lynn left to take their father’s body back to their childhood home town to be buried next to, their mother. They were gone exactly three days. Upon returning Lynn opened the door to her house bone weary and hung her coat in the closet. Too tired to change out of her good clothes she set about making a cup of hot tea. It wasn’t until she sat down at the table and began dropping the amber honey into the steaming cup that she looked up and saw the violet miraculously transformed. There in the window it was covered with a profusion of purple blooms. She picked up a pen and wrote the poem “Truth Told by a Violet.” I don't imagine she thought that the poem would one day be read at her sisters funeral, but I was what Corlyss wanted. Our pastor, Michael Williams said, “At 83, Corlyss died too soon, but had she lived to be 103 I think I would say even then, that she had died too soon.” Corlyss knew about time….God’s time - Just as the violet bloomed in God’s time so did Corlyss.